This is a follow-up post to Why an Apple II Game? My parents bought an Apple II+ computer in the early 1980s when I was 5 years old. I grew up watching my older brothers dabbling in computer programming on that machine and playing cool games like Ultima, Wizardry and Bards Tale. At that age those games were so captivating and also such a mystery to me. The first RPG I recall experiencing was Ultima III when I was around 8 years old. Sometimes when my brothers were finished playing they would take out the disk and let me play the game without risk of accidental saves to disk screwing up their characters. I had no idea what I was doing beyond using the arrow keys to move around, but it sure was fun! 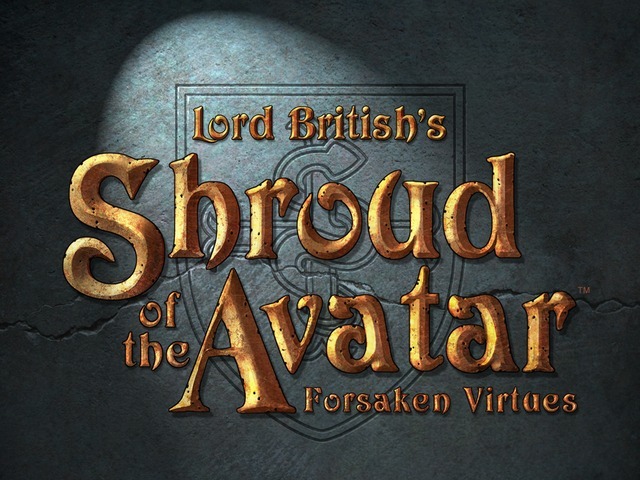 In the last year some of our younger relatives have playtested pre-alpha versions of Nox Archaist and it was very reminiscent of this experience. I began to explore Applesoft basic around the same time and the desire to created my own tile RPG grew quickly. Of course, I had no clue where to start. Over the years that followed I spent untold hours learning programming, playing games and studying them. I also spent a lot of time reading fantasy books like Dragonlance, watching nonsensical movies like Monty Python’s Holy Grail, and imagining some day being able to channel the fantasy creativity they sparked into something of my own creation. As a teenager in the early 1990s I had a light bulb moment. I figured out a possible method to create a tile-based map on the Apple hi-res screen. In theory it would allow the player to move across the screen when the arrow keys are pressed. I remember exactly where I was when the light bulb moment occurred; in a car on the way home from visiting my oldest brother in Oklahoma a few years after he joined the air force. Needless to say, I was very anxious to get home to Wisconsin and write some code to test out my idea. Once back at a computer, I spent many hours programming a proof of concept in Applesoft. I remember the moment when I typed in “RUN GAME”. It whirred for longer than any other program I had every written. I began to wonder if I had broken the disk drive. I thought any moment now it might start working, but instead the Apple offered up a familiar “Beep!”. The net result of those many hours of work was an error message displayed on the video monitor. I do not recall the exact error, but I knew it meant my program had exceeded the amount of memory reserved for Applesoft programs. At this point I was stuck because I could not find a way to allocate the additional memory required to my Applesoft program. As a result, for several years I didn’t know if my tile-based graphics engine design actually worked. Around 1992 my parents bought an IBM compatible 386 computer. One of the first things I did on that computer was learn Microsoft Quickbasic 4.5 and tried again to program my tile-based graphic engine design. Much to my delight it worked! Much to my disappointment, it was horribly slow! 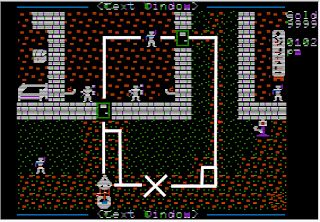 The tile map graphics appeared on the screen and the map moved in response to the arrow keys. However, it was painful to watch the incredibly slow screen draws after each player move. I didn’t know how to resolve this problem and shelved the project. This was the last attempt I would make for decades. For any programmers reading this, the story so far probably begs the question the following question: why didn’t I try using assembly language? My dad is an incredibly smart guy and knew that most commercial Apple II games were written in assembly language. In the 1980s he was a high school chemistry teacher (now retired) and was constantly reading. He would read magazines like Nibble on a regular basis and talk to other people who were experiencing the early personal computer revolution. Unfortunately, like me, he did not know how to write assembly language programs. But, he tried to help. He found the one and only assembly language book at the library at the high school where he taught. I tried very hard to understand the book, but was not successful. At that point my experience with programming was limited to typing in Applesoft basic programs by turning the computer on and tying in the program code at the first prompt that appeared. There was no compiler involved, and in fact I had no idea compiler programs were used for some languages. Of course, assembler software like Lisa, or Merlin existed at the time, which could be used to write assembly language programs on the Apple II, but I did not know that back then. As a result, I was very puzzled when typing assembly commands like “LDA $9000” at the Applesoft prompt did nothing other than produce a beep and a syntax error message. There were a couple adults I came into contact with who had programming experience on main frames. When I asked them about assembly language my vague recollection was that their responses collectively were something along the lines of “I’m not sure how it works on the Apple”. In hindsight I realize that I was asking the wrong questions. And I had the wrong book. The book I was reading was not a book for a beginner, and assumed the reader already had an assembler program and knew the fundamentals of the language. At that time books on programming, especially assembly language, were hard to come by and this was the only one available to me. I was stuck. I’m going to cover about two decades in two paragraphs. The RPG project was stuck on the back burner as I became interested in modems and computer bulletin board systems. I launched a BBS out of my parents house in 1994 and turned it into an Internet Service Provider in 1996, just as the general public started to become aware of the Internet. This ISP was one of only a few local options to explore this new fangled Internet and the business quickly took off. Not long after the company was launched I abandoned my computer programming studies at a local college to focus on the business full-time with my brother and future Nox Archaist project co-founder Mike Reimer. After several mergers and acquisitions, it became the largest independent ISP in Wisconsin in the early 2000s. By 2004, my career had shifted from IT to finance and business. I returned to college part time and eventually completed a bachelor's degree in finance, an MBA, and earned a CPA license. While I occasionally thought about it, the prospects of ever picking up the project of developing an RPG seemed further away than ever. In 2014 I bought an Apple IIe on ebay because I thought it would be fun to play games like Castle Wolfenstein and Ultima again. Mike liked the idea as well and over the course of about a year we replayed many of the Apple games we had enjoyed as kids. After playing though a few games, Mike commented that it would be fun to develop an RPG as a mobile app. We kicked the idea around for a while but it never got off the ground, partly because I still wanted to finish the Apple II RPG I started as a kid. Explaining the reason is difficult. I’m not sure I fully understand it myself. To some extent it is probably a sense of unfinished business and wanting to summit the mountain I tried to climb years ago, so to speak. And, also, I think it’s a good measure of whatever it is about Apple II computers that still keeps tens of thousands of people captivated with them to this day. Coincidentally, the tipping point that led to decide to renew my pursuit of developing an Apple II RPG involved Ultima III, the first RPG I played many years ago. In the fall of 2015 I purchased a 5.25” copy on ebay because I wanted to make a disk image so I could play Ultima III in emulators in addition to my Apple IIe. I quickly learned that the copy protection built into commercial software by developers in the 1980s prevented disk images from being made. I also learned that the solution to this problem required stripping the copying protection off the 5.25” disk, not just working around the copy protection with a program like Copy ][ Plus or Locksmith like I might have done back in the day. For some reason, I wouldn’t let the matter drop. Copying software for the purposes of making a backup or using the software in a different medium (i.e. an emulator) is legal and I wanted the software in a digital medium that would theoretically last forever. I started looking at solutions published in 1980s magazines for removing copy protection from various games. The solutions I found involved typing in some assembly language commands and running a special copy program written in Applesoft. I couldn’t get the solutions to work. As I did research to try to figure out the problem, I found myself learning more and more about assembly language. Eventually, I resumed my search for an assembly language book written for beginners. This time, I knew what kind of book I needed and found it: "Using 6502 Assembly Language" by Randy Hyde. It is written specifically for use with the Liza Assembler, one of several popular assemblers used in the 1980s. I read the book cover to cover, and typed in most examples. The college classes I had in the 1990s on computer architecture really helped in understanding the material in the book. 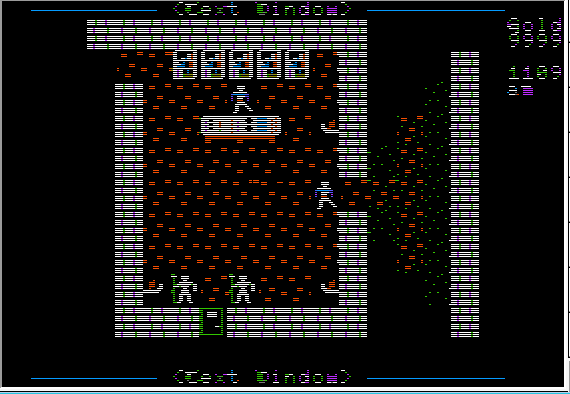 By the time I finished the book I realized that I had learned enough assembly language to make a serious attempt at once again trying to develop an Apple II tile-based RPG. My motivation to crack the copy protection on Ultima III soon faded, replaced by the long dormant desire to create a game. Ok, this probably bears some explaining. How in the world does a finance/business guy who had a few computer science classes in the 1990s pickup one book on assembly language and suddenly know how to develop and Apple II RPG? While the computer science classes were helpful, the many years of trial and error I spent as kid trying to put together a working tile-based graphics engine were the most significant factor. What I found during the process of creating Nox Archaist was that the skills needed to write the other components of an RPG are very similar to those needed for the graphic engine. While there is much more to writing an RPG than the graphics engine, it is arguably one of the hardest parts. To build the knowledge base needed to start programming the game I essentially had to figure out the assembly language required to produce results similar to my old Applesoft and QuickBasic code. This was much easier that it would have been starting from square one with no conceptual understanding of how the engine mechanics worked. My computer science classes from the 1990s helped in figuring out a plan of attack and providing context to what I was reading. For example, I knew that programming languages at their core are very similar, each containing a mechanism for performing flow control, arithmetic, and I/O. I had a basic understanding of the role of computer hardware, the operating system, application software and how they interacted with each other. This made it possible to understand the structure of assembly language and picture how I could use it to do what was necessary to replicate the tile-based graphics engine I had written years ago. While “Using 6502 Assembly Language" by Randy Hyde is an excellent book, it certainly did not contain all the information that I needed. Some major holes that remained were disk I/O, random numbers, hi-res graphics, printing text to the hi-res graphics screen, and a mysterious thing I didn't know I needed called a boot loader. Filling in the holes took months of tracking down old technical manuals and spelunking in old Apple II newsgroups. Eventually I found the comp.sys.apple2.programmer forum which is haunted by some of the few remaining true masters of 6502 assembly language. After launching the Nox Archaist project I also met Beth Daggert, a former 1980s game developer, and Peter Ferrie (aka qkumba), an assembly language master, who have been kind enough to brainstorm with me on a variety of technical challenges. 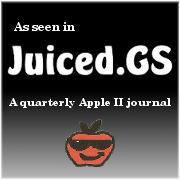 The comp.sys.apple2.programmer newsgroup community has also been very helpful in answering questions. By late 2015 I was writing code for Nox Archaist, though the game had not yet been named. One evening I met up with Mike Reimer for dinner and let him know what I had been up to and asked if he was interested in collaborating on an Apple II RPG instead of an RPG for mobile devices. Soon after it was official. 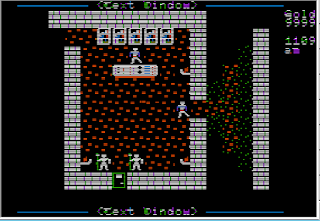 We formed 6502 Workshop and began work on a new Apple II RPG called Nox Archaist. On March 26th of 2016 we launched the Nox Archaist website and publicly announced the project. In September 2016 we welcomed our first team member, Bill Giggie, a professional graphics animator in the movie industry. Bill has been instrumental in providing new and innovative tile artwork for the game. In addition to creating awesome games, a goal of 6502 Workshop is to be a modern resource for information on how to develop RPGs on the vintage Apple II platform. This is motivated in part by the fact that I’ve yet to find a book on the subject. Our intention is to provide information on our website describing this journey and providing insight into the development techniques we used to bring Nox Archaist to life. Hopefully this will help out people with similar crazy aspirations. We welcome any questions you may have! Also, if you've enjoyed this post and/or are interested in Nox Archaist please post a comment and let us know. We really enjoy hearing from everyone! One evolution we explored was improving the intelligence of NPCs, and this is the second posting in a three part series of Tech Talk in which will discuss this topic. A* combines the principles of several pathfinding algorithms, which we’ll review as a starting point. Consider the villager NPC in figure 1. How did the villager figure out which tiles to walk on to locate the door and enter the town hall without bumping into a few walls? The human brain can easily see a path between any two tiles on the map. We “see” the whole map at once. However, for a computer to find a path it must examine one tile at a time. Figure 1: A villager makes his daily visit to the town hall. The examination process involves looking at each tile to see which paths (north/south/east/west) are open and which paths are blocked by obstacles. 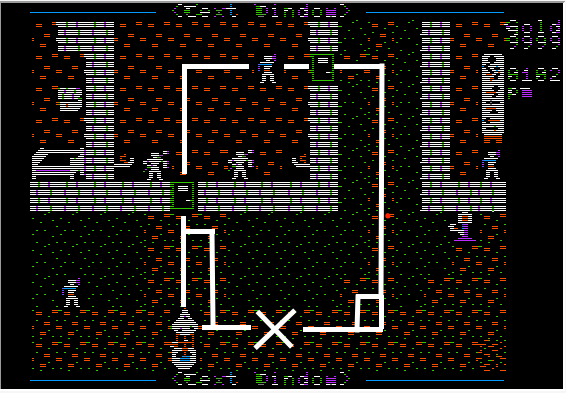 One approach to pathfinding is for the computer to examine every tile on the map and store the open paths for each tile in a database, then look for a combination of tiles with open paths that connect the starting position to the destination. This approach is known as the Breadth First Search algorithm. It gets the job done, but it is very CPU intensive and not practical for our application. It also doesn’t take into consideration variable movement costs for terrain. For example, hills might be slower to move across than flatland. To start building the database, in the first iteration the algorithm examines the tiles adjacent to the starting position. Any open paths are added to the database as “neighbor tiles”. After the algorithm examines all start tiles, it examines one of the neighbor tiles it found in the first iteration and adds any new neighbors found to the database. The process of acquiring neighbors and examining neighbors continues until all tiles on the map are examined. A more advanced algorithm known as Greedy’s Best First Search dramatically reduces the CPU cycles required by examining only a small subset of the total tiles on the map. This algorithm prioritizes by maintaining a neighbor tile queue and sorting the queue by distance with every iteration. Tiles with a shorter distance to the destination are examined first. Distance refers to the number of tiles to the destination, ignoring obstacles. A* incorporates the techniques in Greedy’s Best First Search for finding the shortest distance and adds a terrain movement cost component to determine the shortest path. The process is similar to the techniques used in the modern day networking protocol OSPF (open shortest past first). While A* does a great job of finding the shortest path, we didn’t want our NPCs to suffer the boredom of following the same routes day in and day out. Realistically, a merchant is of course not always going to take the exact same route home every day. Not to mention, bored NPCs might mutiny and ruin the game for everybody. Just sayin’. We found a way to inject realism into path selection and speed up the algorithm at the same time and we call this implementation Nox A*. Our method doesn’t sort the prioritization queue nearly as often as Greedy’s. With Nox A* if a new neighbor tile is found with a shorter distance to the destination than the last tile examined, the new tile is examined immediately and the queue sort is skipped for that iteration. For some paths this decreases the CPU cycles required by over 400%. By skipping instances of queue sorting, the Nox A* algorithm will miss shorter routes that it might find if it sorted every iteration. As a result, Nox A* causes NPCs to take a slightly meandering path between two points. However, with this change alone, the path would still be the same every time. An additional modification was needed to inject some randomness into the path chosen. Since Nox A* immediately examines a new neighbor tile if its distance to the destination is less than the last tile examined, the order in which new neighbor tiles are identified impacts the algorithm’s prioritization. For example, if the algorithm searches for new neighbors in the order of north, east, south, west, then the tiles to the north will always be preferred over tiles to the east even if both tiles are the same distance from the destination and have the same movement cost. Priority 1 = west, priority 2 = south: left/outer path will be taken. Priority 1 = west, priority 2 = east: left/inner path will be taken. Priority 1 = east, priority 2 = south: right/outer path will be taken. Priority 1 = east, priority 2 = west: right/inner path will be taken. The directional priority is randomized many times during the process of calculating a path. As a result, calculating a path between two points over a long distance with a lot of corners will result in many small variances. Another important piece of functionality is obtained through the use of movement costs assigned to tile types. For example, Nox A* treats floor and street tiles as having a lower movement cost than all other terrain. This is how we keep NPCs from taking bizarre routes around town like traipsing through neighbors’ lawns and schlepping through farms fields, all in the name of taking the shortest path. We were also lobbied heavily by the shopper keepers guild to make sure NPCs walked past their shops instead of taking shortcuts. Having the ability for NPCs to figure out how to get around obstacles, including the player and other NPCs, may create the temptation for the player to block the path of the NPC repeatedly. For example, every time the NPC tries to move around the player, the player moves to block the NPC’s path again. We can detect this by incrementing a counter each time an NPC is blocked by the player and this allows for event triggers if the counter reaches a specific value. For example, the NPC might tell the player “Get out of my way!”. One evolution we explored was improving the intelligence of NPCs, and this is the first posting in a three part series of Tech Talk in which will discuss this topic. Tile-based RPGs of the era such as the early Ultima games, Deathlord (cira 1987) and Shadowforge (circa 1989) typically used a flocking style algorithm which enabled NPCs to move randomly while tethered to a specific area of the map. The most advanced implementation we found was in Ultima V (circa 1988), where most NPCs traveled between locations on a town map at scheduled time throughout the day. For example, a merchant might be found at home, at his/her shop, or at the local eatery depending on the time. This feature was likely achieved by storing a hard coded set of x,y coordinates between locations. We observed Ultima V NPCs always took the same path and, if the player blocked that path, the NPC would stop in front of the player. Forever. We saw an opportunity to improve gameplay by enabling NPCs in Nox Archaist to take different paths sometimes, navigate around the player and other NPCs, and detect player harassment. To this end, we decided to attempt the first ever (to our knowledge) implementation of an A* based pathfinder algorithm for regional maps in an Apple II tile based RPG. 1) How to fit it into very limited memory. 2) Make it fast enough so that the gameplay wouldn’t slow to a crawl. 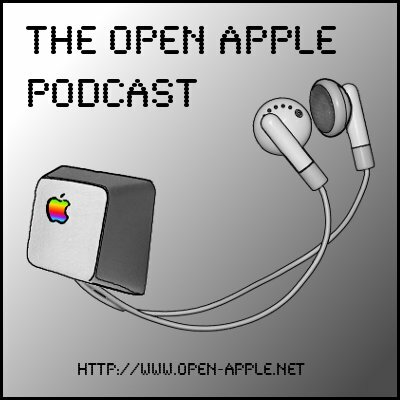 In the next two posts in this series we talk about how pathfinding algorithms work, how we solved these challenges on the Apple II platform using 6502 assembly language, and how we optimized our implementation of the A* algorithm (Nox A*) for improved game play. Nox A* is a custom developed algorithm that NPCs in Nox Archaist use to figure out a route to take when traveling between locations on a town map at scheduled times throughout the day. For example, a blacksmith might be found at home, at his/her shop, or at the local eatery depending on the time. The demo video below shows Nox A* in action, featuring a merchant walking from her living quarters to her store front. Interactive objects such as portcullis, levers and doors. Many animated graphics such as fountains, wells, fireplaces and more! Dozens of NPCs moving about the town on their daily schedules. Conversation with NPCs in a pop-up window. Many thanks to our new team member Bill Giggie for his recent work on the town artwork. Bill is a professional graphics animator in the movie industry and is really helping bring the world of Nox Archaist to life! We are excited to announce a new feature in Nox Archaist. Capability for a player sourced lighting is (finally!) working. This will be used when the player equips items like torches and light generating spells. 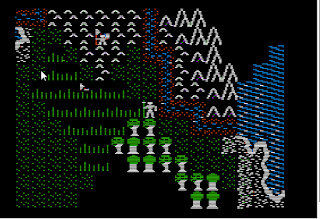 The 6502 Workshop team has been pounding out code for Nox Archaist and the game is starting to come to life. One area that we have been kind of winging is tile graphics art. We would like to offer a chance for members of the retro gaming community to participate in the design of Nox Archaist while hopefully improving the final result and getting the game into your hands more quickly. Starting today we are running a tile contest! 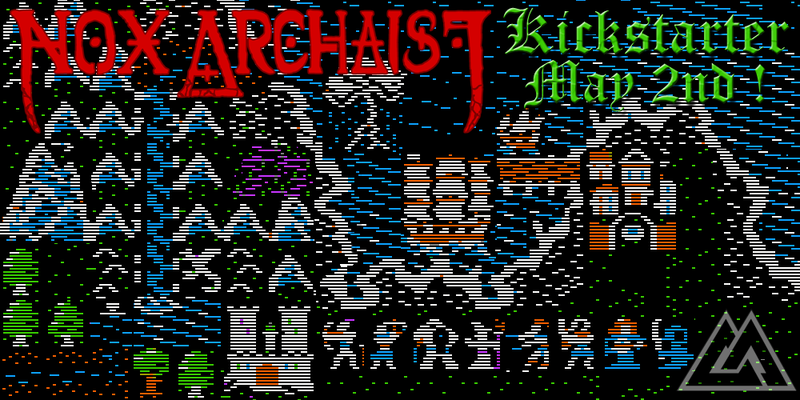 We are excited to announce new features in Nox Archaist, a new role playing game we are developing exclusively for the Apple II platform and emulators. An in-game clock has been implemented in Nox Archaist which allows us to trigger events based on the time of day. The first events we've built off of this new game clock are automatic sunrise and sunset. Stay tuned for a Tech Talk posting coming soon that will discuss how hidden tiles (/aka darkness) are generated in Nox Archaist to simulate sunrise, sunset and terrain such as mountains and trees blocking line of sight. Nox Archaist is a 2D tile based fantasy RPG with a classic Apple II look and feel. We are taking advantage of the full 128k available on the IIe and later models which will help us create features and effects that may not have been seen in vintage 1980s Apple games. Recently we found a bug where the game would crash when a user would boot to a hard drive before launching the game off of a floppy. We recreated this situation by using an AppleWIN hard drive image that booted to ProDOS Basic and then executing a ProDOS command from there to boot from the floppy drive. Below are instructions on how to set this up and some challenges we ran into during that process. The instructions assume a basic understanding of the Windows Command Prompt, CiderPress, AppleWIN, and Copy II Plus. I’m happy elaborate on any steps involving use of this software, just ask. So, we found an interesting chicken-and-egg paradox in this process: booting an unformatted hard disk will result in a crash. How do we load a utility to format a hard disk for the first time if AppleWIN automatically tries to boot from the hard disk once the hard disk is enabled? Hint: It’s not an AppleWIN setting. 1. Create a 0 byte file using a Windows PC. AppleWIN will pop up a window saying it needs to restart. Proceed with the restart. This is because once a hard disk is enabled, AppleWIN will try to boot from the hard disk first. Since the hard disk isn’t formatted, the boot process crashes. Type C600G at the Apple monitor prompt. If you're copy of ProDOS is stored on a .SHK file you'll need to transfer it to a disk image. If ProDOS is already on a disk image, skip ahead to the "Insert the ProDOS disk image" step below. Insert any disk image that contains the ProDOS file BASIC.SYSTEM into floppy drive 1. Copy II Plus 9.1 contains this file and is what I used. *All versions of ProDOS after 1.9 required an Enhanced Apple IIe. AppleWIN configuration options can be set to run the emulator in Enhanced Apple IIe mode. Across the landscape of the world in Nox Archaist both short and tall grass can be found in abundance. Tall grass hides the lower half of mob icons and player icons from view. The player and mobs think they are pretty clever (the player is probably right). When standing in tall grass they go into stealth mode and stop waving their weapons around. Each tile graphics has a unique ID number. The tech topic for this post is drawing tiles. Each tile in the game has it's own shape table which stores the hexadecimal data used by the Apple II hardware to turn on the pixels on the hi-res graphics screen. The shape tables are stored on disk and loaded into auxiliary memory when the game boots. There is a subroutine called DRAW.TILE at the core of graphics engine which will draw any shape table at any location on the view screen's tile grid (currently !17 tiles wide X !11 tiles deep). The tile grid location and the shape table to use are passed as parameters. Since the shape tables are 14x16, as noted above, DRAW.TILE is designed to draw 14x16 shapes. It does this using a loop. Like all loops, it has a stop value that triggers the end of the loop. How does this relate to tall grass and the lower half of the tile being hidden? If the player is standing on a map location with the tile ID for tall grass, a parameter is passed to DRAW.TILE which tells the routine to use a different stop value, thus triggering an end to the loop after only the top half of the shape is drawn.